DEEPEN YOUR KNOWLEDGE AND EXPAND YOUR TEACHING SKILLS IN THIS ADVANCED LEVEL COURSE. (RYT-500). alternatively, modules may be taken individually for continuing education credits or to further deepen and specialize your study of yoga. This training will take both your personal and teaching practice to the next level. You will study the body/mind structure, bridge yogic philosophy with western science and develop the tools to support and serve diverse populations of students and communities. You will leave with a deeper understanding of your individual purpose and the confidence to build a teaching practice that reflects that purpose. You will take an honest look at your teaching practice and reflect on how you can improve. Through technique and skill based classes, feedback from your peers and teachers and hands-on workshops, you will experience a tangible shift in the level of your teaching. Dive into yogic philosophy, and the western psychology and neuroscience that supports and mirrors that philosophy. By bridging the east and the west, you will find a new language to translate the beautiful tradition of yoga to your students. This module is all about action. You will identify your own personal gifts and talents while gaining tangible skills to work with the populations that interest you. This is a time to move beyond the constructs of the yoga studio and expand how, where and who you teach. What distinguishes We Are Yoga from other 300-hour programs is the individual attention. By limiting the size of our teacher trainings, we can incorporate personal mentorships and individualize teachings and practices to meet the needs of our small groups. 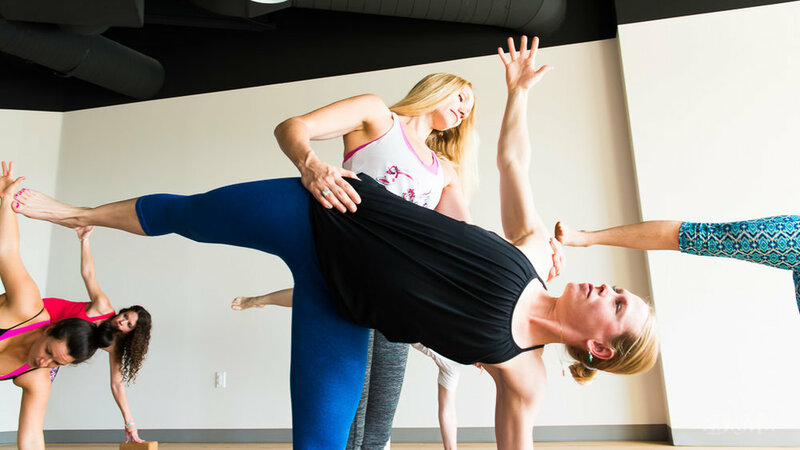 We want you to experience the joy and support that both a personal and teaching practice can create in your life. Visit We Are Yoga's website for more details and registration. "I recommend this teacher training to anyone that has interest...having this kind of experience is so valuable in expanding your practice. Rachel teaches you to question yourself on an entirely new level." "I loved being a student in the teacher training program at We Are Yoga. Every aspect of our training was a personalized learning experience, that was tangible and practical. What I gained immediately from the modules presented was the ability and freedom to develop my own personal practice from a creative space within myself. After completing the training I now have the confidence to share yoga with new students, friends, and family. Investing the time in myself to come to each weekend intensive was very enriching. Our modern world often relies on technology and online classes, however, the practical experience of being with classmates was the most rewarding experience for me. "